Have you ever found yourself saying ” Don’t be sad/ upset/ angry/ worried”? Often, we find ourselves saying this to others when we are in a tricky situation, especially with a child . But have you considered that this may not always be the right thing to say? Before we explain to our children what they can do to help the negative emotion go away, acknowledging the emotions (and indeed our own) is a vital skill that we can teach from an early age, which may help them grow up understanding that sometimes it’s okay to not be ok. I remember a time when I was teaching my class in school about fears and how to deal with them. When I explained that I too, was fearful of the dark and spiders they were surprised, and began to realise that intense emotions are normal for everyone. Even Daddy night be scared of heights! Step 2 – Normalise– try explaining that all children and adults get scared/worried/sad sometimes and that it’s part of growing up. Step 3- Support – try some breathing techniques or gentle yoga stretches to help clear away the feeling. You could try the 5 finger breathing technique, by slowly tracing the outline of each finger and thumb on one hand with the index finger of their other hand. As they do this, encourage them to breathe in slowly as they trace up each finger and exhale slowly as they trace down each finger. They could also try the Humming Bee breath, where they gently cup their hands over their cheeks as they close their eyes and hum quietly through the mouth. Increasing the loudness internally by placing the hands over the ears as they hum, or placing a finger in each ear will bring a feeling of calmness to the mind and body. 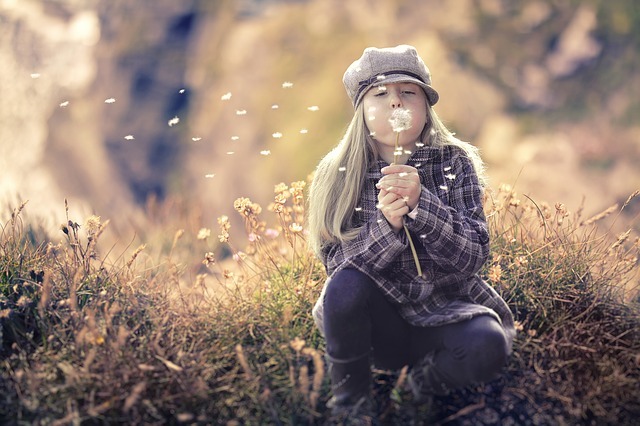 Or the Dandelion breath, where you ask them to imagine they are smelling a flower as they inhale through the nose , and blowing a dandelion as they exhale through the mouth. I hope the above tips help your child to understand and manage their emotions a little more, please let me know if you try them and how it goes! For more tips and videos on breathing and calming techniques, check out my Facebook page @yogapebbles and be sure to keep an eye out soon for the April blog post! ⟵NEW TWEEN/TEEN CLASS COMING SOON!